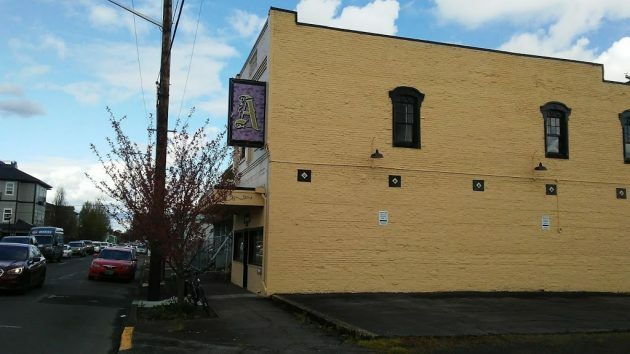 The Schultz Building on East First Avenue, shown on April 12, may house a “gluten-free” restaurant, according to plans presented to the city. I wrote about this building a year ago after seeing a couple of beautifully restored American muscle cars displayed behind its ground-floor windows. You can read the story and subsequent comments here. On Wednesday, the Central Albany Revitalization Area will take up a request by Shawna Turkins, who in 2016 opened Homegrown Oregon Foods, a gluten-free commercial kitchen now housed inside the Marrakesh Salon at 229 Fourth Ave. S.E. She has a five-year lease on the ground floor of the Schultz Building, wants to move her operation there and open a restaurant, and intends to buy the property before the lease expires. Turkins is asking for a $15,000 CARA grant to cover about 15 percent of the cost of the first phase of renovations to turn the first floor into a restaurant. She has private funding and a bank loan for the rest, according to a CARA staff report, which recommends approval of the grant. The money would come from CARA reserves now totaling $1,490,000. According to the staff report, the restaurant project meets CARA goals, which are to revive the old part of town economically by, among other things, preserving historic resources and utilizing vacant properties. Some years ago, a CARA grant helped the building owners remodel and renovate the upstairs apartment. Is she going to have a gluten free menu? There are more people than one might think who can have some pretty severe reaction to products that contain wheat, barley, rye and under some conditions oats. It makes it very difficult to be able to dine out, especially when staff is not familiar with or carless about keeping orders correct and avoiding cross contamination which is difficult under the best conditions. Yes, I think having a gluten-free menu is the idea. We’re going to continue being an entirely gluten free/dairy free kitchen. We’re excited to expand our menu and hours to better serve the community. They are extremely cautious and aware. They never bring gluten into the kitchen in order to make sure it safe. Cross contamination is a big scare for a lot of us who are gluten free and they understand that. It’s so nice be able to order anything of the menu and not worry about it. Yay! This building is so interesting in architecture. How great to have a gluten free restaurant in Albany. I’ll be there! The expansion is exciting, but there’s no need to wait. You can enjoy Homegrown Oregon Foods’ gluten-free selections now. Check out their menu at http://www.homegrownoregon.com I love the Cilantro Lime Shrimp! This is one CARA endeavor I will hold my tongue on & support. So what the heck…it’s only money so up the anti a bit to lessen costs & give a start up a better chance. I just recall when on the PD & the place was the Adult Store. One nite the tire store next door burned down. ‘Ole Lt. “Pappy” Harold Katchel was fuming & fussing the whole day after that the AFD had “saved’ the Adult Store. Bless his straight laced blue heart!! Cool! This is always good for Albany. We should also claim our gorgeous Willamette, like Seattle is doing with its bay front. Why having the railroads and empty warehouses occupying such precious space when we could have a wonderful river park for everyone? Thank you for sharing this inspirational story. Shawna is amazing, her food is outstanding and investing in her business will be beneficial for our community. Homegrown Oregon Foods is a great resource for healthy lunches, an easy catering choice for meetings that can accommodate a variety of dietary restrictions, and weekly food prep menu for those who want a satisfying gluten and dairy-free meal without having to make it themselves. We utilize all of these options regularly and have recommended them often.